Schoolboy stabs and kills another student -- fracas because brother reprimanded lover! 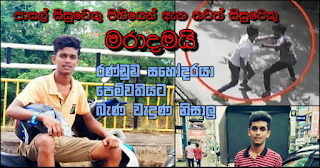 A 19 year old schoolboy passed away being stabbed in a fracas which took place near a tutory down Elawella Road in Matara last afternoon (24). down a narrow lane close to the class concerned when this fracas erupted. What transpired was that two assailants who attacked the two friends of the deceased and was taken to a side, the main suspect in this episode had targetted attention on the now deceased student by attacking him with a middle-sized knife which incidentally was recorded on a CCTV camera. One such stab was so severe enough to pierce the abdomen of the student and within a minute he had collapsed, bleeding. Later the neighbours had rocked in and taken the victim in a three-wheeler to hospital. However even by the time he was admitted to hospital he had passed away, it was understood. Another student who sustained the attack is still under treatment in hospital. The deceased is Rasindu Gimhan, a student of St. Thomas's College, Matara studying in the 13th year in the Science stream, residing in Thihagoda. The main suspect responsible for the murder, Sithija by name and the other two students have fled the area and police have started investigations to track them. What the mother of the deceased schoolboy had mentioned about the murder was that a brother of the deceased has had threats from the student Sithija and Rasindu who died had intervened in this conflict with the assailant. Deceased Rasindu is the second in a family of four. A problem has cropped up between one of his brothers and murderer-suspect Sithija over a romantic involvement. An attack has ensued because Rasindu's brother has reprimanded was involved in a case of scolding which has ended up in a fracas and on that occasion there had been a fight. In that particular instance Rasindu has intervened on behalf of his brother and had put up a fight and saved the brother. Subsequently, as a counter-attack for that fight, this case of stabbing has taken place yesterday.